Such a hearty soup! Makes about 8 cups! 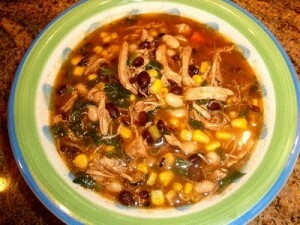 Place the onion, chili beans, black beans, corn, tomato sauce, beer, and diced tomatoes in a slow cooker. Add taco seasoning, and stir. Arrange chicken breasts on top of the mixture, pressing down slightly until just covered by the other ingredients. Set slow cooker for low heat, cover, and cook for 5 hours. Remove chicken breasts from the soup. Stir the shredded chicken back into the soup, and continue cooking for 2 hours. Serve topped with shredded Cheddar cheese, a dollop of sour cream, and crushed tortilla chips.